When I tell people I’m a yoga teacher, they’ll often chime in with a story about how they tried yoga a few times for stress relief, but at the end of class, they didn’t feel any different. They wound up frustrated that they weren’t getting the immediate results that they were hoping for, and they gave up. If this sounds like you, know you’re not alone. 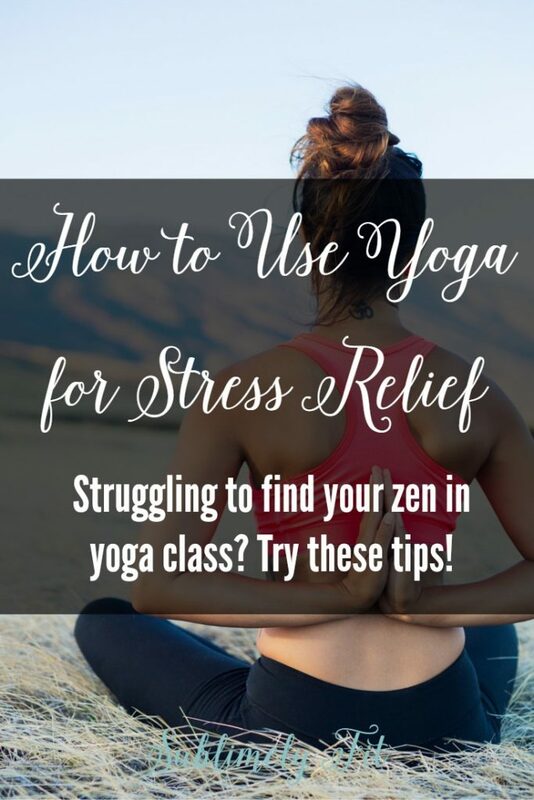 It’s tough to let go, but I hope that this post will help you learn how to use yoga for stress relief. So many new yogis have an expectation that they’ll immediately feel a huge sense of bliss and calm after their first yoga class. That’s often not the case. Yes, yoga is incredibly helpful, but if you’re really stressed out, you’re probably not going to be able to let everything go in one yoga session. Just like most important things in life, the art of relaxation takes time. So much of the stress relief yogis experience comes from clearing the thoughts from their head, when they find a moving meditation. However, turning off your thoughts sounds a lot easier than it actually is. Most of us almost constantly have thoughts running through our heads—our to-do list, conversations with coworkers, or even what we’re having for dinner. It takes time and practice to learn to quiet those thoughts and be present in the moment. Give yourself time to learn how to use yoga for stress relief. There are a lot of different styles of yoga out there, and my favorite style of yoga may not be your favorite style of yoga. That’s totally fine! For example, with my anxiety disorder, I found it very difficult to quiet my thoughts in a slow, gentle yoga class. However, a more vigorous vinyasa flow class allowed me to burn off more adrenaline, which did a better job of helping me cope with my anxiety. Know that every person is different, so find a studio that really speaks to you and what you’re looking for out of a yoga class. Some will focus more on the yoga poses, giving you lots of cues for how you should position your body. Others will tend to focus a little bit more on the mental aspects of your yoga practice. Try a few classes out until you find a studio you really love. When you’re so used to being wrapped up in your thoughts, it’s good to have some tools and tricks to use to help clear your mind. It’s great to have small things you can do while you’re practicing yoga to remind yourself to remain mentally present. I love to sigh heavily when I feel my thoughts and stress coming back up in the middle of class, which really helps me release my mental baggage and brings me back to the present moment. I’ll also visualize releasing tension and negative thoughts on my exhales. You could also try using breathing techniques like a ujjayi breath, which can remind you to keep breathing when you no longer hear your deep inhales and exhales. And, I always remind myself to focus on my breath and the sensations in my body throughout class, which helps me clear my mind. The key is to find something that helps you recenter yourself when your mind starts to wander. At first, your mind will begin to wander automatically, but with practice, you’ll start to notice when that happens, and you’ll be able to bring your attention back to the present moment. Like I said at the beginning of this post, learning how to use yoga for stress relief isn’t easy if you’re used to keeping it all in. But, with practice it will get easier and it will start to feel like second nature. Practice consistently, set the intention to do everything you can do clear your mind and let go of your thoughts, and you’ll find the stress relief you’re thinking soon. Want to learn more about how to use yoga for stress relief? Be sure to watch my Yoga for Stress Relief video on YouTube! I was honestly in the same boat when I first started Yoga and was just hoping for this magical cure for all my life problems. It wasn’t until I consistently started doing yoga at home that I saw a big difference in my body and mind. Finding a type of yoga that fits you is always very important since I have never been the biggest fan of restorative yoga for instance since I want a little more motion and speed.